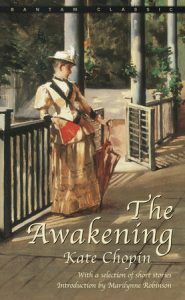 Written by Kate Chopin, The Awakening was the second and final novel to be published by the feminist, controversial writer. Published in 1899 during the first wave of feminism, the novel was extremely ahead of its time in its criticism of the patriarchal society and prevailing gender roles in the late 19th and early 20th century. The novel is centered upon the awakening of Edna Pontellier who vacations with her husband and her children Etienne and Raoul in Grand Isle, Louisiana. Edna has an epiphany that makes her realize her dissatisfaction towards the life she leads and her role as a mother and a wife and further seeks romance with Robert Lebrun. Robert and Edna’s connection proves to be more profound than Edna’s connection with her husband who sees her as a mere object. Upon the end of her vacation and her return to new Orleans, Edna’s eyes are opened as she begins to break societal conventions one at a time and rather than return to her previous role, chooses the route to self-satisfaction, freedom and independence. Edna’s emotional and psychological turmoil pushes the novel forward as the narrative is focused on Edna’s most profound internal thoughts and her reaction to the world around her. The character experiences an emotional awakening when she embarks on an affair with Robert, a self-gratifying awakening when she re-claims ownership of herself and chooses to live independently away from her husband and children, a sexual awakening when she embarks on an affair with Alcée Arobin, and finally a sense of emptiness and despair that leads her to take her own life. Such a take on the psyche of a woman, extramarital affairs and suicide were considered a major taboo at the time. In fact, Chopin’s third person narrative style openly expresses sympathy towards the protagonist and advocates the actions and the feminist ideologies suggested. As a result, Chopin was heavily criticized for her novel which is described by critics as selfish, vulgar and offensive. The controversy went to the extent that the novel was even banned in certain libraries. However, that downfall was short lived as today the novel is widely known as a landmark in American and feminist literature.